B. Thomas (Arlington, Texas, United States) on 29 July 2014 in Lifestyle & Culture. Cash Only. Your new teeth are ready. Good luck! Buffalo Gap Historic Village is a great place to see the West Texas frontier from 1875 to 1925. It has a rich collection of Indian artifacts and frontier firearms. 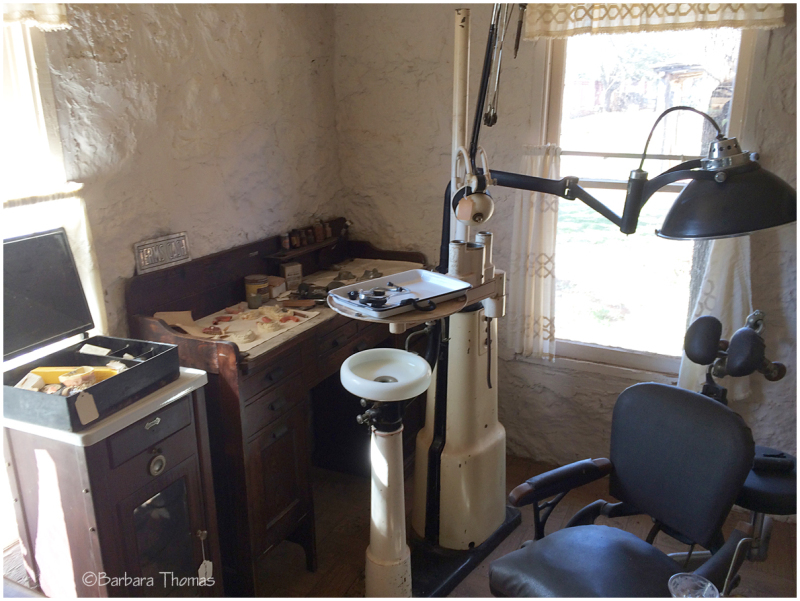 There are 20 historic frontier buildings including the Dentist Office. It makes my teeth ache just looking ! @Ronnie 2¢: Aw, Ronnie, I thought those were your teeth lying on the table. Oh, so funny - can you maybe send me the best ? Je n'aimerais pas me faire soigner les dents dans ce cabinet là... un peu trop rétro pour m'inspirer confiance. Intéressant de nous montrer ce lieu "à l'ancienne"
Je préfère ceux d'aujourd'hui , même si j'y vais " à reculons " !!! I prefer the ones of today, even if I go "reluctantly"!!! happy S T !!!! Aw!! It give me a scare !!!!! Wow...I can just imagine ...!! A superb photo ! A fine shot of the equipment dentist's used to us. Sadly, I can remember being drilled upon by a belt driven drill which was slow and painful. Oh no, i just can't imagine, that makes me shiver!! Interesting capture of this dentist office of another time. I think I'll reschedule for the year 2014!! Surprisingly, I don't see the pliers handy!! Happy ST!! Yikes! It hurts just looking at this photo! Happy ST. Interesting image! Many old-fashioned horrible instruments are well captured!